No, the news piece on WGN-Chicago did not call these gardens exactly that, but the idea is exactly the same as Cancer Victory Gardens™. 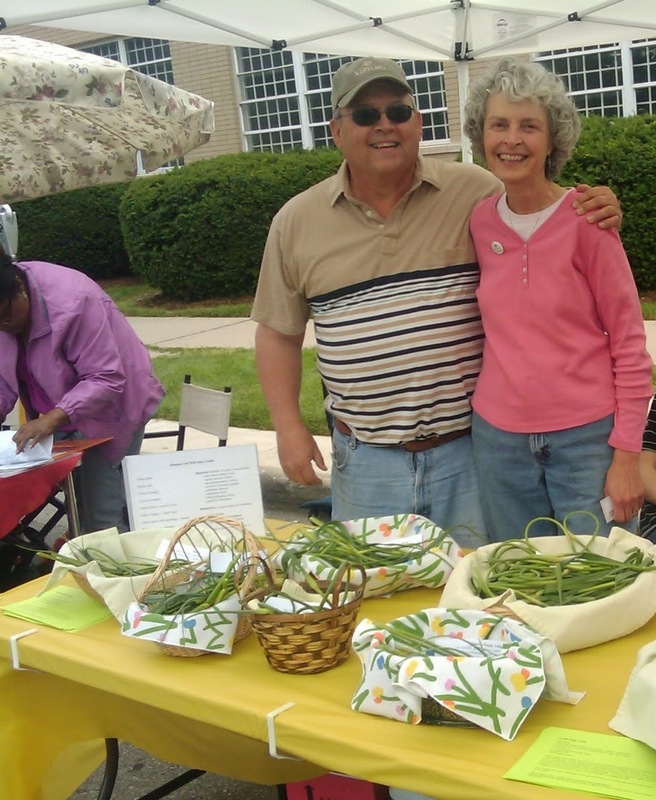 The Be Well Lake County(IL) Diabetes Program is encouraging people with diabetes to grow a "diabetes garden" to increase their intake of vegetables, i.e. by taking charge of one's own health through vegetable gardening. In addition to helping lose weight and eliminate some medication for diabetes control, the statement that really caught my attention was the gardener who stated "This is my first and only garden. Once we started, I found out it was really exciting. I love it and we're going to do it again". Those are just different words that convey exactly what I hope the tag line for my blog inspires: "Cultivating health through a garden's nourishment of both body and soul". To make this news piece even more exciting for me is that Cheryl Bell, the registered dietitian heading up the program is a friend of mine. I have no doubt that Cheryl's love of great-tasting food (and nothing beats locally-grown food for great taste!) plus her passion for using food to help improve the health of her community will lead to many more of Lake County's 50,000+ citizens who have a diagnosis of diabetes (without counting the thousands and thousands who also have pre-diabetes, many not yet diagnosed) becoming involved and excited about growning their own diabetes garden in the future. "Cultivating health through a garden's nourishment of both body and soul"
It is also the email address that my blog at www.cancervictorygardens.com directs people to use if they would like to send me a photo and a short description of their own cancer story and how gardening has been important to their cancer recovery. So every time I open that account, I confess that I am always a tiny bit excited and hopeful! 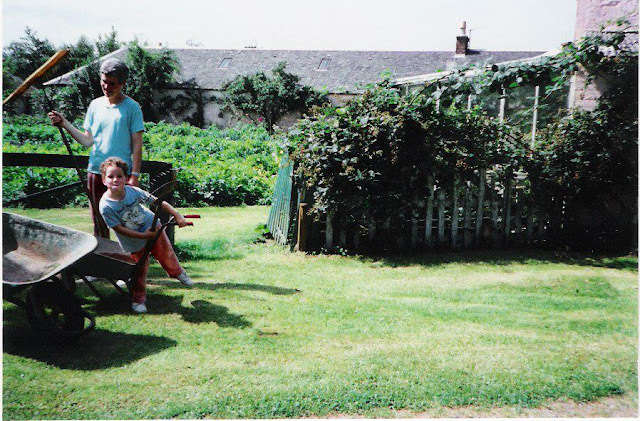 Today I received an email and photo from a newly diagnosed cancer survivor named Anne who gave me permission to share her story on this blog in the hopes that other people will also be inspired to both look to and work toward their future through gardening. Her email and one photo made my day in a way that brought a tear to my eye, a smile to my face, and joy and compassion in my heart, all at the same time. Little did I know that I too have a Cancer Victory Garden. the first nasturtium bloom yesterday and am about to harvest the first cucumber. I can see the nasturtium blooming, which is beautiful, in fact, at first glance, it seems too beautiful to eat (even though it is an edible flower!). However, I can also see how its full healing potential could be utilized and appreciated by including it as both a decorative and healthful component in a salad. Gardens can heal our bodies and our spirits, by giving us a means to look both forward and inward, as Anne has expressed. The blooming edible flower is a perfect example of how to capture and take delight in all of the ways that a garden can bring joy and healing to us. 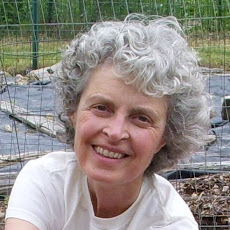 Thank you, Anne, for sharing your cancer victory garden story. I hope you will send me period updates. I send you all my best wishes first as you undergo your cancer therapy and then beyond to your cancer recovery journey. May you have decades and decades of health, healing, and hope along with enjoying your bookcase gardening! 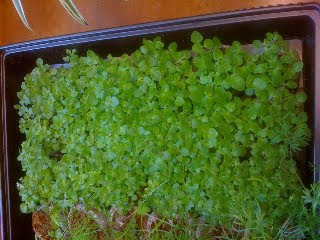 Here is the second update from the Cancer Victory Garden at the Trinitas Cancer Center in Elizabeth, NJ! 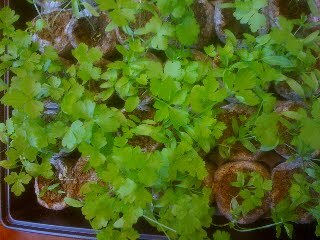 Hi Diana- Just to keep you posted about the herb garden at Trinitas Cancer Center in Elizabeth, NJ. 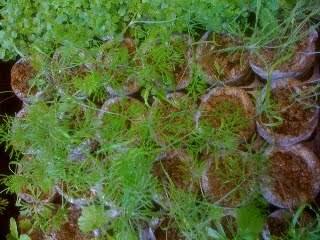 We have lots of herbs!! When I put out the signal that I was looking for someone to take over the garden, our Complementary Medicine Nurse contacted me. 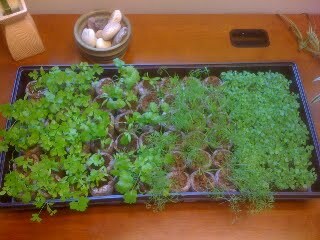 She would love to start a healing garden in the courtyard with these plants. What could be better??? Hospital administration still needs to give her the okay, but she's coming upon some roadblocks. She has a lot of plans and it warmed my heart to know someone else wants to go forward with this project. It won't be long before the baby plants will be transplanted to go home with patients and hopefully also into a new herb garden in the courtyard of the cancer center. How lucky your patients are to have you on the medical team contributing to their comprehensive care at your cancer center. Please keep us updated! This post is a cross-posting from my dianadyer blog (my first time to do so) to make sure that all my blog readers have an opportunity to watch the upcoming documentary next week, as important to all cancer survivors as it is to the rest of the television watching audience. The movie is about how we care for (or don't) our soil, the very foundation of our food production and thus life and health on this planet. The word 'dirt' is just a catchier word. In fact, I have heard that the author of the book Dirt: The Erosion of Civilizations took flak from his professional colleagues (other geologists and soil scientists) for the title of his book, but that is what big publishing houses do to try to catch the public's attention in order to increase sales (most authors lose control over such details as the title and the cover image when their book is published by one of the main book publishing companies, just one reason I have turned down offers from two big publishing companies to take over publishing my book).